Each year, there is at least one horse you take an instant liking to; one that is easily accessible and has great presence and character. This year, that horse is Itsmyluckyday, who arrived at Churchill Downs as if he’d been there his entire life. 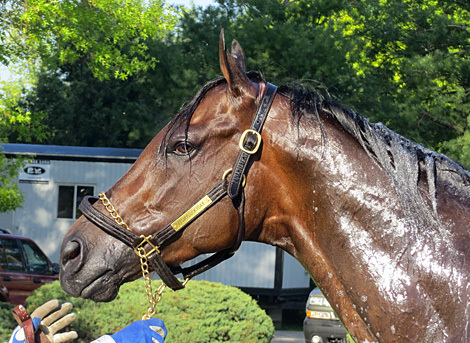 You always like to find that happy horse that stands out, and Itsmyluckyday is indeed a happy horse, thanks to the TLC he receives constantly from trainer Eddie Plesa Jr.; his wife Laurie, who is part-owner of the colt; and longtime assistant Frankie Perez and exercise rider Peter Shelton. After three days, the son of Lawyer Ron has jogged once and galloped twice and has looked better each time, moving over the track with authority and showing all the signs of a horse ready for a peak performance. Whether that is good enough to beat these horses going a mile and a quarter is anyone’s guess, but there is no doubt he will give 100 percent. 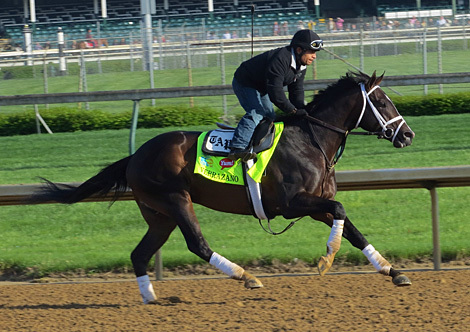 And we have already seen what his 100 percent is capable of in the Gulfstream Park Derby and Holy Bull Stakes. What makes him stand out from a numbers standpoint is the fact that he ran a negative 1 1/2 on Thoro-Graph in the Gulfstream Derby, and instead of “bouncing” off that, as one would expect, he actually came back with a better number, running a negative 2 in the Holy Bull. 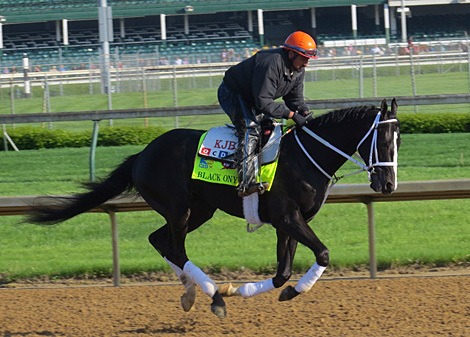 Given two months off to freshen up and recharge the batteries, he was expected to be a bit short for the Florida Derby, and even though Orb ran right by him he still wound up running a “1” in the race, and it wouldn’t come as a surprise if the Derby isn’t run much faster than that. 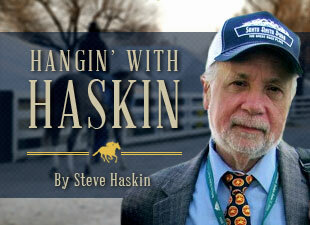 All he has to do is improve slightly off the Florida Derby and he’s right there. 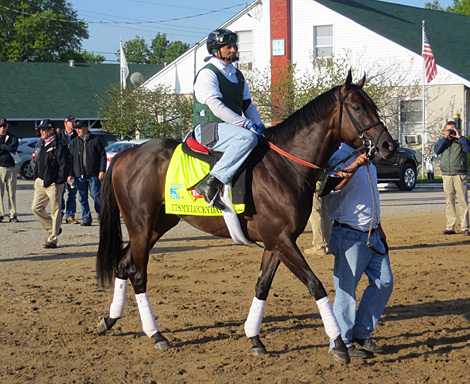 It’s just a question whether he moves forward going 1 1/4 miles and whether you feel that not being wound fully tight for the Florida Derby accounted for his inability to withstand the closing surge of Orb. What Itsmyluckyday has going for him is his toughness and competitiveness, and that is exactly what co-breeder Rob Whiteley had in mind when he bred the colt’s dam, Viva La Slew, to Lawyer Ron. Viva La Slew’s dam, Viva La Viva, who Whiteley also bred, is by Crafty Prospector, and Whiteley wanted to cross the tough Crafty Prospector with Lawyer Ron, who was as tough and competitive as any horse in memory. In Itsmyluckyday, he got exactly what he was hoping for. 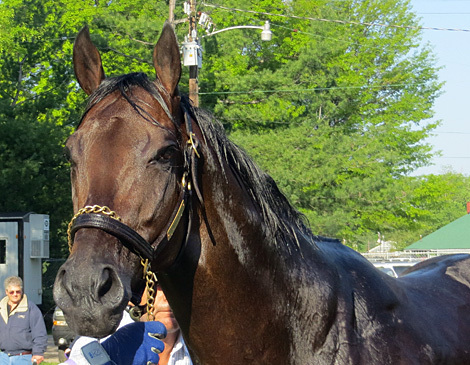 Inside his stall, Itsmyluckyday is an easy-going, personable horse who is extremely approachable. 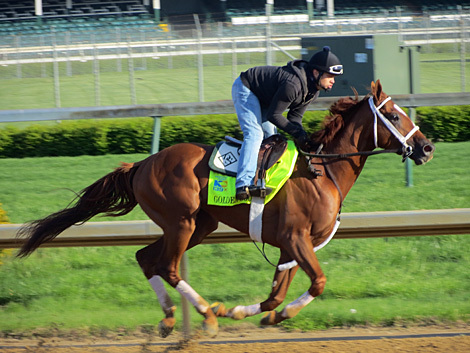 But once he gets outside the stall and on the racetrack he is a tiger, who loves to train and compete. If there is one thing that is fairly certain, Itsmyluckyday will be overlooked in the betting, and Plesa is fine with that. He says he’s more interested in having the media stop by after the race than before. Itsmyluckyday heads to the track. As for today’s activity, Todd Pletcher sent his five Derby horses to the track and all galloped with the exception of Revolutionary, who just had a short jog and quickly exited well before the others. Overanalyze and Palace Malice, my two overlay specials, both galloped strongly. 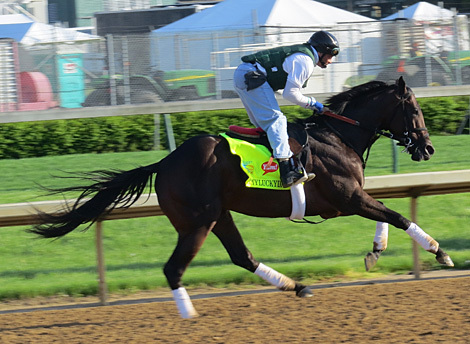 As mentioned earlier, Itsmyluckyday had another strong gallop and looked as good as anyone out there. Normandy Invasion continues his brisk gallops, and I have to mention one horse who has made great strides in the past week, and that is Black Onyx, who has been here some three weeks and appears to be thriving. 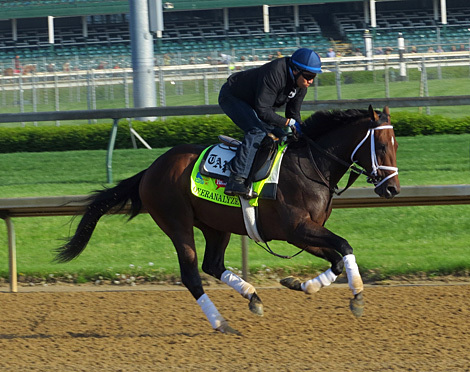 He is looking stronger physically and galloping with more purpose, and in this crazy era of grass and synthetic horses running big in the Derby, who knows?